Comment promoted: what are we to make of the second face on the reverse side of the Turin Shroud? | Is the Shroud of Turin really some kind of supernatural photographic 'selfie'? ← Might those be flecks of congealed wheat gluten one sees on the Turin Shroud? Evidence for unique one-off white flour imprinting? Good day Colin, I’ve been reading your blog and you’ve revealed things to me I never knew about the shroud given all the hype that’s out there. Just wanted your opinion on something. What do you make of the “second face” on the reverse side claim. I’ve heard even some pro-shroud people deny it. Do you have a post about it? Thanks. No, I’ve never addressed the claim for partial obverse reverse-side images as yet, notably face and hands, feeling as I do that I needed to be better informed as to the nature of the topside image first. When I say images, I mean ones that can or cannot be seen with photographs alone, rather than those problematical computer-aided reconstructions reported by Giulio Fanti and his team. Mario Latendresse put a couple of photos up on his sindonology.com site a while ago. I’ve taken the face, shown first “as is” and then after photoenhancement in my unsophisticated MS Office Picture Manager, using just the 5 controls in brightness and contrast. (There’s probably no point our discussing THAT claimed image unless agreed on whether there really is one or not!). PS: Beware: the photoedited one has also been left/right reversed, unlike the ‘as is’. Apols for that (it was done for future use, when comparing with topside image). Well if there is no image, where is the hair coming from unless the front image isn’t as superficial as they’re saying? It’s hard for me to believe a lot of the pro-shroudies given the spurious nature of a lot of their claims. I saw your comment on Dan Porter’s site about the graphite background and the picture of the red painting on linen. Could this be a light phenomena? assuming the images are as superficial as they say. In any case, I’m convinced that the shroud is a fake. I think the image of the hair may come from the outlines of the painted blood and perhaps some oil substance staining through which adds to the paredolia. In the big picture I think this is the last thing Christianity has seeing that they’ve lost when it comes to creationism, geocentrism and Adam and Eve. Seeing that all these things have been debunked. I think the shroud will follow. Yes, the pro-authenticity folk in general (Mario L a notable exception – see his site) seem to be relaxed about an image that is on both faces of the Shroud, albeit exceedingly faint on the obverse side, yet say there’s nothing in between! That takes quite a bit of explaining, wouldn’t you say, and I don’t recall seeing any attempts as yet to come up with a cogent explanation? I have one, and it’s tentative, so am pleased to see your thinking is at least partly along the same lines. Yup, we’re talking about OIL. My flour imprinting works best when there’s vegetable oil present, not just to attach flour to the skin initially, but to help colour development in the oven too. The oil helps to ‘micro-fry’ the particles of flour, which then proceed to turn brown due to Maillard reactions. A small surplus of oil then acts as a liquid vehicle, allowing that cocktail of yellow/brown Maillard products to penetrate the weave of the linen. The likely route for capillary migration is the narrow channels BETWEEN the fibres, as can be easily modelled with ink ( I did a clip for YouTube back in 2015 , enter “dynamic penetration of ink” into your search engine), so the brown cocktail can get from one side of the linen to the other INSIDE the threads, out of sight, and then, if there’s sufficient, proceed to stain the opposite face where they emerge. So why an image (of sorts) on the opposite face, rather than a mere oil stain? Maybe the Maillard cocktail deposits solid polymeric highly-pigmented melanoidins on its short journey. The latter attach strongly to the fibres, so that the migrating oil gets cleaner and cleaner, finally scarcely visible in the cloth, leaving the pigmented image on the obverse side roughly the same shape and size as the topside, but not exactly the same (which might explain Fanti’s curious finding that the main and subsidiary image were not quite identical in his computer-assisted imaging). Thanks for the interest Matt. Let me know if you have any further insights. Right or wrong they are all grist to the mill. Thanks for the appreciative reply, Matt, and for giving this Shroud investigator an opportunity to finally grasp – after 5 long years – that particular nettle as regards the reverse-side face! Feel free to call in again – anytime. Informed comment is especially welcome. If I have any afterthoughts on that reverse-side face, I’ll tack them on the end here in the coming days or weeks. Comments invited. ( Warning: the site’s WordPress host requires me to vet a contributor’s first-time comment before it can appear. Thereafter they are displayed immediately). Rapid but short-lived transport of Maillard products also accounts for the peculiar characteristics of image threads and their fibres as seen under a low power microscope (see Mark Evans photomicrographs). Yup, I refer to (a) the so-called half-tone effect and (b) abrupt discontinuities in fibre coloration. The half-tone effect (an unhelpful – and probably over-simplistic term in my view) is shorthand for saying there are – or may be – only two kinds of image fibres – coloured (full tone) and uncoloured (no tone) – with no in-betweens. (Think of it as akin to the use of binary numbering (o, 1 only ) in digitized imaging). Discontinuites refers to the presence of cut-offs in coloration along certain fibres for no obvious reasons. Both these effects are explicable if it’s assumed that there’s a limited supply of hot, briefly-liquified Maillard reaction products from the heated flour imprint that migrate rapidly for a short distance only along and between the fibres of linen threads. That results in even-staining of some but not all fibres (half-tone effect) with abrupt cut-offs in coloration (discontinuities) when the supply of liquid from the superficial thermal zone is exhausted. Here I am, some 36 hours after posting, and STILL the major search engine has failed to spot this latest posting. Had I posted it on my sciencebuzz site (Google -hosted) it would have appeared almost instantly! Oops. Mustn’t be seen to have a down on the internet Google giant, must I? Nope. Microsoft’s Bing site also fails to show it in its first 20 listings under a (shroud of turin ) search. (But then Microsoft’s Bing has NEVER listed this site – to the best of my knowledge. There’s something distinctly rotten (or at any rate, PC-obsessed) in the Stateside search engines – Google, Bing etc, something we Brits and Europeans have to be content with, no local alternatives being available. Musn’t offend your Stateside Catholics, must we, Google, Bing etc? PC-obsessed , ideas-stifling Stateside PC rules OK? (Or should that be multi-billion $ e-commerce income ?). Here’s a link to my specialist Shroud of Turin site. It has been running for more than 5 years, has well over 400 postings, advances new models and theories, yet continues to show up NOWHERE in your listings under a (shroud of turin) search. It’s currently listed on Page 5* of Google.uk returns. Why are you effectively censoring me, preventing my original research and ideas from reaching Bing searchers? Is it because my views are anti-authenticity? Is it because you are keen to spare the feelings of those whose religion predisposes them to favouring authenticity? Since when has it been the job of a search engine to protect anyone from the real world? Yahoo? I’ve just searched the first 20 pages of Yahoo under (shroud of turin). No listing for this site, confirming previous experience over the years. Why not? Who knows? What I do know is that there was no mechanism for sending the same message to Yahoo as the one I sent Bing earlier this morning. (There was a word limit – unannounced upfront!). What I did find was a page that invited me to “submit” my site as if Yahoo were doing me a favour (nope, it’s web site creators who are doing YOU a favour, Yahoo) but that would require “registration”. Hey ho. Google has finally spotted this latest posting, which (for all its faults) says a lot more for Google than it does for the deeply-suspect Bing or Yahoo. Thank you Google. You came through for me (at last!). But there’s a downside to the world’s favourite search engine where this site is concerned, but it needs a sharp eye to spot it. Yup, that’s this site, shown 3 entries down on Page 5 of returns. So what would you expect to see if you had entered (shroud of turin), which I suspect a majority of folk will do, with or without the unnecessary “of”. You would expect to get a similar or identical result, yes? Well, you don’t. You will get the same result as the one I discovered and announced many months ago. You will find NO RETURNS FOR THIS SITE, at least on the first two dozen pages or so, even assuming the search engine allows you to access so many pages. I’ve sent one final, despairing email to the search engine, using its Feedback facility, attaching my name and email address, asking it to correct this anomaly forthwith. If there’s no reply by the end of the day, I’ll reproduce the email here, and then think about acting on my threat to devote a full posting to the iniquity of being deprived of clicks, readers and page-ranking by the perverse nature of what I’ve described above. At least I get a listing of sorts, which is more than one can say for Bing and Yahoo (see earlier), those two blights on the blogosphere who continue year after year to display their hugely suspect -and I assume partisan – blind spot for this site. (Yahoo I’ve discovered currently lists 5 or 6 different postings from a rival pro-authenticity Australia-based Shroud blog scattered throughout the first 20 pages of returns – which basically says all one needs to know about its impartiality and professionalism). It’s now 2100 hours on Thursday March 23. I’ve jusr rechecked the page rankings on Stateside google.com. No change. 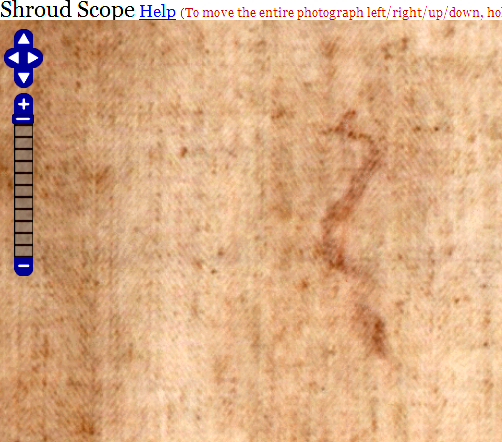 If one searches under (turin shroud) this site appears on Page 5. If one searches under (shroud of turin) my sciencebuzz site appears on Page 18, but this site appears NOWHERE. That’s despite logging a complaint many months ago. Nothing’s been done. Is it any wonder this site has near zero impact in the USA, since most folk there probably make “shroud” the first word in their search. Yet again, I see my UK-based site listed on Stateside google.com under (turin shroud) but curiously and perhaps significantly NOT under (shroud of turin). This is at best bizarre, but it’s also deeply worrying, indeed suspicious, since you are depriving me of searchers and readers, which then means I don’t get the Stateside ranking that I believe my site deserves after hundreds of postings over 5 years. I’ve made this same complaint to you before, via this Feedback facility and online, but nothing has been done. I’ll wait 24 hours, and if I’m still not listed on google.com under (shroud of turin) then I’ll make a separate posting of this strange anomaly on the part of your allegedly algorithm-driven search engine. I shall be flagging up my strong suspicion of ‘dirty tricks’ by those who attempt to influence Google listings and rankings – Stateside especially – under (shroud of turin) but who have carelessly it seems overlooked the alternative (turin shroud) – arguably a smoking gun. Please deal with it NOW, not next week or next year! Have discovered that this, my latest posting, DOES appear on a Stateside search under (shroud of turin) but not under the default “Any Time”. One has to specify “Past week” or “Past month”, accessed via the Tools tab (which I suspect few general users ever deploy). So the crawler and algorithm are picking up the existence of this site, and displaying it briefly, albeit to the cognoscenti wanting to know what’s new, but filtering it off from the main “Any Time” shop window. Well, I’ve long suspected that Google goes in for window-dressing , correction, BIG correction, window-EXCLUSION, on entry-level searches, giving the lie to any suggestion that page rankings are determined purely by an algorithm (at least an algorithm that is responsive to objective criteria only, making no value pre-judgments as to likely ‘mass appeal, special-interest appeal’, outside interest credit-card flashing appeal etc.). Google etc claim to be search engines, not mere e-commerce trade directories, so should perform as such, and indeed should be made to do so, via regulatory agencies, at least when ranking sites beyond their own shores, regardless of where those rankings are displayed! In short, this site, MY site, is being partially-discriminated against, failing to appear when a Stateside searcher enters (shroud of turin) into his or her default-setting google.com. My own countrymen and women in the UK face no such filter. Big deal! I accuse you Google of cyber-colonialism. You are wilfully preventing my site from receiving Stateside attention and visitors which I believe it warrants after 5 years and hundreds of postings. Indeed, I would be saying the same if my site were brand new! The Shroud of Turin is of international interest, whether seen from a religious or scientific perspective. No one should be denied the right to know what is being thought and said online by folk in other countries that contributes to the worldwide debate. As others have been saying in recent days in regard to other more serious matters to do with your modus operandi, Google, notably your placing UK taxpayer-funded ads onto anti-Semitic, neo-Nazi YouTube videos, it’s time you cleaned up your act, across the board. I repeat: it’s time you cleaned up your act, Google, across the board. (As for Bing and Yahoo, words fail me). Trying to figure out how to please Google’s algorithm is rather like trying to appease an omnipotent, capricious and ultimately unknowable god. You may say as long as Google’s top results are useful to searchers, it’s tough luck on those who rank lower – and if those results stop being useful, then some other pair of students at Stanford will spot the gap in the market and dream up a better way. Right? Maybe – or maybe not. Search was a competitive business in the late 1990s. But now, it may be a natural monopoly – in other words, an industry that is extremely hard for a second entrant to succeed in. The reason? Among the best ways to improve the usefulness of search results is to analyse which links were ultimately clicked by people who previously performed the same search, as well as what the user has searched for before. Google has far more of that data than anyone else. That suggests the company may continue to shape our access to knowledge for generations to come. Professor Brian Cox: Can science survive in our post-truth world? Answer: no, not when California’s control freaks are allowed to rig their search engines to get the e-commerce friendly “look” they want. Opening para’ (my italics) : In our post-truth universe, where facts kowtow to personal belief, where does that leave science? Professor Brian Cox thinks carefully before saying: “It is important for people in my position – by which I mean scientists that have some sort of public voice – to say that not all opinions are equal.” The 49-year-old physicist, TV presenter and all-round cheerleader for rational thought has seen long-held facts under fire of late. Last week, basketball supremo Shaquille O’Neill expressed his view that the Earth is flat; Donald Trump’s former rival, now colleague, Ben Carson says he doesn’t believe in the Big Bang. .. Still on my anti- (so-called) search engine rant, I got to wondering if it was just Stateside google.com that was preventing entry-level (shroud of turin) searchers from accessing this site. Answer: NO! The same applies to searchers on Canada’s google.ca and Australia’s google.au. That’s on the default “anytime” setting (I may be visible on past week, past month etc which few will use). I then had a sudden thought (when using google.ca). Why have I never seen Mario Latendresse’s splendid sindonology.com site with its invaluable Shroud Scope when searching on google.uk or even google.com, at least not in the first dozen or even 20 pages? Has Mario been given the same blackball treatment as this investigator, despite being pro-authenticity (indeed, a founder member of the Shroud Science Group)? Answer: YES!. Search (shroud of turin) on his own country’s google.ca, and he’s not listed anywhere on the first 20 pages! I was right not to entertain dark conspiracies about sindonology (aka shroudology) being at the root of this exclusion from All Time Google listings. If that were the case, Mario would be getting special treatment. He’s not! There now seems little doubt that it’s Google deciding what entry-level searchers under (shroud of turin) should be allowed go see, and not see. In short, Google is not acting as a search engine pure and simple. It’s either manually ‘curating’ what comes from its allegedly algorithm-driven crawler OR has cleverly programmed the algorithm to reject sites that fail certain Google-ordained criteria. And what might those criteria be, one wonders? Might they be an aversion to facts, to ongoing research, to (dare one say) SCHOLARSHIP, the latter having no part to play in its e-commerce promoting business model, one that delivers billions of $$$$$$ each year via pay-per-click? Yup, I suspect that to be the answer. Google (and its minor competitors like Bing and Yahoo) are all in the business of dumbing-down internet search, killing the true spirit of enquiry. Something has to be done about these ethically-blinkered, greed-obsessed control-freak Californians, and soon!!! This site is presently listed at the bottom of Page 5 listings under a (shroud of turin) search on google.uk. That’s despite several hundred postings over the last 5 years. many highlighted on other sites, notably Dan Porter ‘s shroudstory.com up till Dec 2015 and elsewhere, and many links to other sites (which Google says are crucial). Yes. a one-off posting by the Jehovah’s Witnesses, with no long-term interest in the Shroud, or indeed any obvious reason to be interested, is allowed to push a specialist long-term interest site such as this down to the bottom of Page 5. Indeed, many such one-off ‘passing interest’ sites have been allowed to do this, thanks to the deplorable Google algorithm (with or without human intervention) making this and other more informed, on-the-ball sites scarcely visible. This site was set up 5 years ago with the aim of reporting online, in real time, the progress of an investigation into the how and why the Turin Shroud could have been fabricated in such a way as to fool modern-day scientists (or “scientists”) into thinking it was authentic 1st century provenance, allegedly and mistakenly a genuine image of the crucified Jesus. Thanks to Google and other California-based so-called search “engines” I now realize that the internet was not the hoped-for means of delivering new research, new thinking, new ideas, new theories into the public domain. The page rankings are a cesspit of accumulated human-deposited crap. Yup, these last 5 years have been a complete and utter waste of this investigator’s time, thanks to his trust and reliance on search engines to transmit findings under a simple straightforward (shroud of turin) internet search. Goodbye sordid, disreputable Google et al. I regard you as enemies of human enlightenment and progress, indeed of Western civilization. You will henceforth be treated here with the contempt you richly deserve – and ignored completely. If I do another posting, it will be negative in its take on all things sindonological, given the array of vested interests that refuse to LISTEN to opposing opinions. This entry was posted in Shroud of Turin, Turin Shroud, Uncategorized and tagged capillary migration, channels between thread fibres, flour imprinting, giulio fanti, Maillard browning, Mario Latendresse, micro-frying, reverse side face, vegetable oil. Bookmark the permalink. 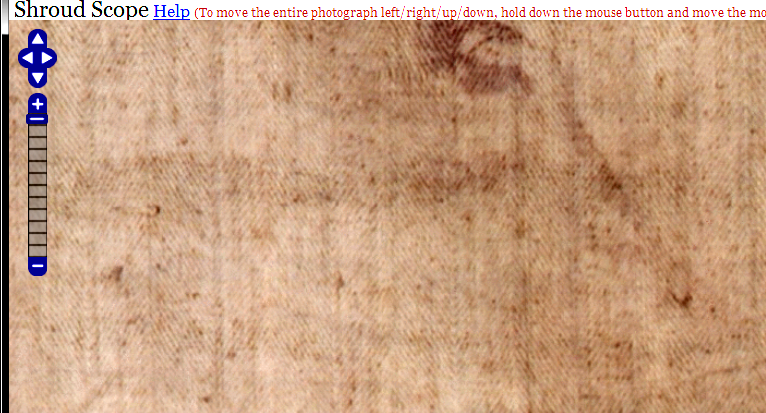 36 Responses to Comment promoted: what are we to make of the second face on the reverse side of the Turin Shroud? It’s worth pointing out that wicking-away of a (briefly) liquid chromophore could play a key role in either a pro- or anti-authenticity context. Naturally this invesitigator has focused on the latter, given that the current Model 10, first proposed over 3 years ago, featured a liquid chromophore from the word go – wicking away being proposed as an explanation for microscopic appearance of image fibres (‘half-tone effect’, discontinuities etc). But let’s recall that STURP wasted no time in dismissing team-member Sam Pellicori’s sweat-imprint model, maintaining that any image-making mechanism that depended on absorbing a liquid into the linen would have left a ‘signature’ in the form of capillary spread, clogging of fibres etc. But what if there had been capillary spread, but not visibly via whole threads and the spaces between them, or even via spaces between individual fibres? Who’s to say that wicking-away might not have taken place completely out of sight, using the capillary channels that exists between microfibrils WITHIN the cores of individual fibres? Indeed, might that not be said to at least partially account for the ‘second face’ image on the reverse side of the cloth, given that it’s claimed there’s no sign of image chromophore between the major image on one side and the scarcely-visible ghost iimage on the opposite face? There wouldn’t be, not if the chromophore was hidden away inside individual transit-facilitating fibres! Naturally, I’m not swinging over to the Pellicori model. Indeed, my Model 10 has been given a shorthand description of “SIMULATED sweat imprint”. In other words, the first pilgrim viewers at Lirey, mid 1350’s, were provided with a Pellicori model of sweat-imprinting that they were led to believe took place 13 centuries earlier in the 1st century AD in faraway Palestine. Maybe STURP was too quick to dismiss the Pellicori model (meaning they neverstopped to consider a medieval faking of Sam’s sweat-imprinting scenario, the one he started to model with lemon juice, oils etc ), once their strawman alternative of ‘just a painting’ had been ruled out. Hello again Lee: here’s my response to your September 18th reply, to which WordPress provides no direct Reply tab. Firstly I am no longer terribly interested in the authenticity v non- authenticity question. I have not been since 1988 (radiocarbon dating). Those who consider the C-14 result to have been obtained from a repair patch have a simple recourse – namely to request a re-run on a wider range of samples. The ball’s most definitely in your court, Turin, Vatican…. As regards the image superficiality claim, the ball is also not in my court, as – forgive my saying – you seem to imply. The ball is in the court of those who claim the image to be ultra-superficial, while providing no convincing evidence whatsoever. I challenge them here, via the internet, to provide what they should have done already, namely to supply a cross-section of an image fibre, obtained via a light-microscope. That way, we should be able to see how far the image penetrates. I say the image colour (yellow or brown) does NOT stop where the superficial PCW (primary cell wall) meets the underlying microfibrils (aligned longitudinally!) of the secondary cell wall. Repeat: the image coloration has never been shown to be restricted purely to the PCW. Indeed it would be difficult to do so, given the geometry with those longitudinally- arranged microfibrils of the secondary cell wall. Let’s be seeing a transverse (cross) section of an image fibre, if only to be convinced that the image really is restricted to the PCW, and does not penetrate those underlying longitudinal SCW microfibrils. If it does reach the SCW microfibrils, who’s to say the image chromophore (if temporarily liquid, as I propose) is not partially or completely wicked away out of sight via capillary channels between those microfibrils?). What’s needed is equal attention paid to both pro-authenticity AND medieval ‘faking’ scenarios. That’s something STURP failed to deliver (providing the ‘strawman’ “just a painting” alternative to authenticity instead). Some very valid points made there Colin. Where i mentioned about the superficiality .. I speak as someone who takes the STURP teams word on their results. I can see you do not. Not the scientific method i know. I trust people too much lol!. What i meant to say was .. Have you had any of the fibers from your experiments tested to see how thick the image is ? If so .. What were the results? I believe your proposed image formation explanation has a lot of merit Colin. I need to read through a few more of the posts in your blog. Personally .. I believe the shroud image was formed through more than 1 process. For example. I am sure you have heard of the Volckringer hypothesis? I propose that at some point in the shrouds history .. When the Flowers were added .. The Lactic acid was transferred via capillary transport throughout the shroud. I am not proposing that it is the primary mechanism .. But i believe it contributed .. Who knows .. Maybe what you think caused the image played a part also and the lactic acid from the flowers (due to the heat) was absorbed into the shroud and via the capillary action mixed with the flour etc. See late addition, 22nd June to this April 2017 posting, Lee. Thanks .. I will set about reading that in a moment. 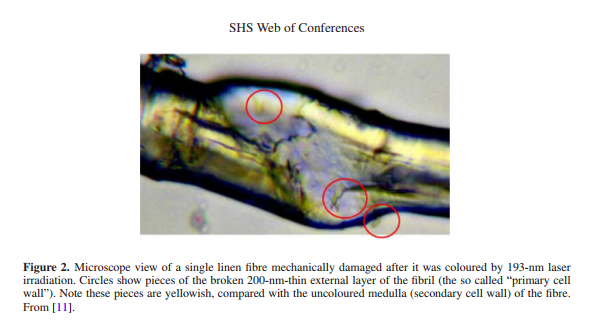 I will ask Barrie Schwortz if he has any cross-section images of shroud fibers .. He must have some. If he has then i will see if i can send them over for you. Have you never asked him for any images? He was the 1st guy i E-Mailed regarding obtaining images of the shroud. Two E-Mail’s later he sent me 2 TIFF format images of the shroud he took in 1978. He’s sent various others also during our talks .. He’s a top bloke 🙂 .. Where you say ” mix authentic v non-authentic models into one” .. Do you mean authentic as a natural process and non-authentic as a deliberate forgery ? .. It’s not that much a leap in the dark in my opinion. I have read in places about people maybe touching the image up over the years or adding certain things. So something could have naturally occurred which contributed towards the image or separate parts of the image .. Then somebody did something similar to what you propose caused the image,or certain parts of it. I still have a long way to go regarding research into world of Sindonology .. But like i was saying earlier .. I think the closest any of us are ever going to get regarding the actual image formation mechanism,is what sounds viable to the individual .. And as you well know .. viability is relative in the shroud world lol .. One swears by radiation released as a by-product of the resurrection event .. Another by the image being caused by an Earthquake (which if i am honest .. has a lot of merit for reasons i wont go into here as i would be typing all night) .. Others are convinced (such as yourself) that the image is the result of forgery etc etc. All in all this results in perpetual stagnant area of research. Unless new information is brought into the fold. I know your thoughts on this .. Mine are similar lol. Hope to speak soon Colin. Given you have a working relationship with Barrie Schwortz (which I don’t!) then by all means approach him Lee, and ask if that required cross-section of an image fibre is somewhere within his and STERA’s copyrighted archive. But suppose it is. If so, then why’s it not already appeared in the public domain, given that a TS of an image fibre is arguably the first thing an objective non-partisan researcher would seek out? I asked the very same question last November on one of my postings, on seeing a “mechanically damaged” image fibre substituted for a TS, and interpreted as if it were a TS! Have just been re-reading a Paolo Di Lazzaro paper from 2015 (one of those open access communications – free of charge, but questionable re the thoroughness of ‘peer review’). Here’s a photomicrograph from that paper with an attached claim that I’ve been pondering for quite some time with ever increasing scepticism – fuelled by my own model system, my own microscopy. Am I the only one to see the serious methodological shortcoming in the above ‘experiment’ with what is described as a ‘mechanically damaged’ fibre (how seriously damaged???). What should PDL have done instead? Clue: view the “TS” (short for something other than Turin Shroud, something to do with microscopical technique…). Yes, if one really wants to know where the colour is in relation to the outermost layer of the fibre (the PCW, i.e. primary cell wall) AND the inner layers too (S1, S2 layers of the secondary cell wall) one does not, repeat NOT, rely entirely on the kind of image and methodology displayed above! Ever heard of a microtome, wax-embedding, transverse sections etc Dr.Di Lazzaro? See this posting of mine from Jan 2013! Indeed I have, or rather did, read that paper by the true-believer Prof. Fanti shortly after it first appeared, Lee. Suffice it to say it would never have got past me, had I been asked to referee it (I’ll spare you the reasons, this not being the time and place to articulate further my views on the use and misuse of the “scientific” method). All I’d say for now is that there are 19 figures in that paper, no less, which are deployed to back up the author’s pro-authenticity pitch. Each and every one of them is a view of WHOLE and largely intact image or non-image fibres. NOT a single one is a transverse (cross) section which I consider were needed to support Fanti’s claims/conclusions e.g image confined to 200nm PCW, “corrugations” in the PCW etc. There’s only one mention of inner SCW “fibrils” (none whatsoever of “microfibrils”). That’s despite their likely impact on a technique as subtle and complex as polarized light microscopy, given the anisotropy of the microfibrils in 3 (yes, 3!) SCW layers, oriented differently with regard to the fibre’s long axis. Look at Fig 15, and you’ll see what is almost certainly evidence for an interaction between those inner microfibrils and polarized light that puts everything else into the shade. That paper needs rewriting from start-to-finish…. Understanding the subtlety of the TS image requires in my humble opinion a detailed knowledge and understanding of each of those 3 SCW layers, their constituent microfibrils and matrix embedding, and the image-wicking channels that must exist between them! I am sending Colin an image of the face area of the reverse side of the shroud that i have been working on. They are derived from an uncompressed image of the Durante image from the 2002 “restoration” lol. You can (in my opinion) see alot more facial features than you can with Prof Giulio Fantis image as i believe he was working with a compressed image as his base. I ran a few processing filters/techniques and then split the color channels. The black and white image with the arrows on is derived from the processed image i made from the base image (as it appears to the naked eye) I am sending the images over to Colin now. I’ve attached your image to the tail-end of this current posting, together with a copy of your comment here plus a few words of my immediate reaction. I have to say I find myself as bemused as ever by that ‘second face’, one that piles enigma on enigma! Thanks Colin. Like i was saying,the black & white image i sent you was a green channel split from the original processed imagedriginal. I will send over the original and processed images also. Shroudscope may be getting an update soon with some of the HAL9000 images i sent to Mario L. So keep a look out on there also. See further addition to my current posting, Lee, comparing your new image with that of the celebrated Enrie 1931 negative . Ignore if you wish the aside directed at Lord Hugh Farey and his haughty attempt to summarily dismiss imprinting off a real human subject in that Feb 2018 40-page blockbuster pdf of his, only just now brought to my attention, 7 months post- publication, in favour of a bas relief – which I regard as possible but not probable). Hello again Colin,to save me reading back through many many postings lol .. Regarding your hypothesis on the image formation mechanism behind the shroud image. How far along are you?. I noticed recently you were wanting cross sections of image bearing fibers? Is that to compare the results of your experiments and verify that the image chromophore is entirely superficial to the PCW?. What are your results in relation to their superficiality? 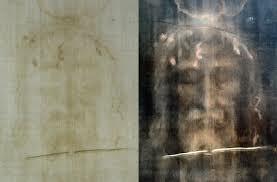 I think what some people forget when trying to replicate the shroud image, is the fact that the shroud is definitely a couple of centuries old .. and perhaps even more than 1 or 2 millennia old. And artificially ageing it (in my opinion) does not equate to the actual effects of time,the elements,entropy etc. This has bound to have an impact in the way the shrouds image and fiber composition (molecular,chemical etc) are now compared to when it had just formed. Coupled with the fact that the replication attempts do not have the added factor of genuine ageing,we do not really have a base for comparison,as we do not know enough about what the shroud was like when it was freshly formed. Personally due to the lack of data,nobody will ever know for sure what caused the image. Unless perhaps a proper set of tests are established?. With a set of unbiased scientists (multidisciplinary). But even then i think a lot of it will be guess work? As regards that ‘second face’, were you aware that I included the image in my current posting, the same one as shown in this one, taken from Mario Latendresse’s sindonology.org site? I’ve tended to keep an open mind as to whether it’s real or not. That’s the result of once taking a model scorch image and placing it face down on a white background, and seeing what I thought was a faint reverse-side image, but which disappeared if the white background was replaced with a matt black one. I finally tracked the effect down to a back-reflection phenomenon: light was penetrating to the opposite side of the linen, turning from white to yellow via wavelength abstraction by the image pigment, them being back-reflected (off any white surface) through the tiny gaps in the weave where weft and warp threads intersect! Why my current interest in the ‘second face’ especially if real rather than some kind of artefact or pareidolia? As somebody once pointed out on this site a while ago, the three-sided frame on the TS face, standing apart from that same ‘second face’ , the one we call “head hair”, seems slightly more prominent than anything else (like nose, eyes etc, essentially invisible). That might be evidence of sorts that the “hair” may have been imprinted separately by our medieval artisans, maybe from a rigid bas relief or similar, or even painted/brushed/finger-daubed on separately with imprinting medium (flour slurry?). Any chance you could try sending new images to me initially via email for adding to this site, my being a little wary of 3rd party sites that try to get too chummy? Sindonological pseudoscience does not get much worse than this. Which referees on Plos One allowed this paper through? Name them! Thanks for your interest (and visit). Hi Colin are you aware of a recent scientific article released around June 30th showing new research on samples obtained from the shroud? It was revealed that blood was found from these samples and they reveal chemical coumpounds that are released into the blood stream during a traumatic injury on the body. Im skeptical of course as too how prevelant these chemical conpounds really are in the blood stream. Also if real human blood is found how would that play into the hoax or creation of the shroud? Did the creator cut his own hand lol! Seems as though you are greatly educated on the subject and the only skeptic who is consistently doing research into the subject. Thanks for your great work I plan to continue to read through it and learn more about this subject. Heres the original research paper: http://journals.plos.org/plosone/article?id=10.1371/journal.pone.0180487. Just wanted to know your thoughts, thanks! Are you still around (I’d understand if you weren’t, you being as you’ve said a busy fellow with a wide range of interests)? Previously I thought it was a mechanism operating entirely from the imprinted side, relying on capillary transport in the narrow channels between the closely packed linen fibres within each linen thread. I’ve now had to revise that view. I now think there’s something going on INSIDE each linen fibre, maybe involving even narrower capillary channels between cellulose microfibrils within linen fibres (maybe not) and that effects of oven heat on the most superficial hottest parts of the reverse side of the linen are activating that mechanism so as to produce the second reverse-face image. See my latest photomicrograph copied/pasted from the end to the start of the posting. In short, the ‘second face’ effect depends on simultaneous heat BOTH sides of the linen: a preponderance of heat reaching the reverse side of the linen favours a more intense reverse-side image as can be shown experimentally using different geometries inside the oven as regards position of linen relative to source of oven heat. These are early days experimentally – there is much more to be done. For now, let me leave you and other site visitors with this thought: if the reverse side image on the newly-created Shroud was anything like my model system, then it comprised highly superficial coloured fibres mixed in with many uncoloured ones, giving an overall impression of faint straw colour. But those coloured fibres were fragile and brittle, and over the centuries many will have snapped off as a result of handling and fallen away, leaving the merest hint of reverse side colour that we see today! For all we know, the early owners of the Shroud did not care for the reverse side image, and may have hastened its disappearance with gentle brushing, snapping off those brittle reverse-side fibres! The pen used to be considered mightier than the sword. But the online keyboard is sadly not mightier than the world’s favourite search engine, not while the latter pursues its own mysterious self-interested agenda, no doubt influenced by outside pressures ..
Btw, whats the vertical line that looks like a fold running down the length of the Shroud on the one side. I looked at shroud scope and it looked like its part of the original cloth, is that a fold or something? Someone was trying to prove to me along time ago that that was the (already debunked) “invisible reweaving area”. Could you fill me in on that? It’s the so-called side strip, approx 6 inches wide Matt. The weave is continuous with the main body of the Shroud, with some suggesting there’s been no separation – the seam being a tuck to create piping, others that for reason or reasons unknown, the edge was cut completely off then reattached to preserve the original alignment. Nobody can call themselves a real sindonologist until they have racked their brains on the side strip, then produced a pdf full of ifs and buts leaving the reader none the wiser. I’ve yet to cross that particular bridge. Thanks again Matt. I’ll start with your 5, order still to be decided, probably posting the first on Saturday pm am (UK time). First I have to compose a preamble, making clear how and why things have gone seriously off-beam in sindonology. The rot began to set in with the 1981 STURP summary*, the background to which can be found towards the end of John Heller’s 1983 book on his involvement with the STURP project. Wild and inaccurate ‘acid-fixated’ chemical speculation involving atmospheric oxygen, essentially mimicking the natural ageing of linen cellulose, was promoted in the STURP Summary as if established fact, discouraging more promising lines of experimental modelling, notably those involving THERMOchemical as distinct from mere chemical ones.Then the propaganda started against anything that could be tagged as a “scorch hypothesis”, with the ludicrous claim that “all scorches fluoresce under uv”. It’s time that someone started to set the record straight. I guess that someone will have to be me. Thanks Matt. Any thoughts on which to tackle first (first 5 or so)? I was interested in 8 and 23 (I would call it a failure, instead of ill judged) the whole vanillin “dating” has every flaw that creationists level against radiometric dating and I’m willing to bet a lot of these shroudies are creationists (maybe not all). 19 and 2 especially 2 because its a laughable argument like looking at a whale and calling it a monkey. There IS “blood” on the hair. 29 as well. In summary 8, 23, 19, 2 and 20 where the ones that stuck out the most. Hello again Matt. Are you still looking in? If so, here’s a progress report. I’ve listed some 27 points – see below – re STURP’s performance (plus later authenticity-promoting ‘sindonologists’) that I consider represent a hugely irritating and frustrating non-enlightenment as regards the nature of the Turin Shroud. Let’s not mince our words: most could have been avoided by more careful selection and screening of personnel, more objective, less bedazzled by things such as so-called “encoded 3D properties” (just one of many instances of galloping pseudoscience)). My next posting, to be started at the weekend, will take each of those 27 points from the outline skeleton and develop them more fully. It will take days, probably weeks, to do justice to them all, but I’ve decided to make it a single posting. To keep length to a tolerable minimum there will be a few images only (I may decide to set up a separate image archive elsewhere, having 2 other semi-dormant websites to choose from). Sounds like a plan, I look forward to reading. The Shroud image is said to be super-superficial, yet I have still to see any quantitative measurements to justify the alleged 200nm thickness. Do they exist, or are we being conned with still more fanciful, self-serving pseudoscience (“too superficial to be man-made”)? The obvious way to measure image thickness would be to look at a cross-section of an image fibre under the microscope, maybe with added contrast, to make the faint yellow coloration appear as dark brown. That’s a cross- section note, since one can learn next to nothing about image thickness from a longitudinal section, e.g STURP’s Mark Evans photomicrographs. I have yet to see sindonology display an image fibre cross-section. Why not? That’s one more black mark to STURP and its so-called ‘documenting photographers’. Microscopic cross-sections play a hugely important role in science. If anyone knows of an image fibre cross-section, please supply a link. PS (added Tue April 4). I should have said “cross section of entire thread“, it being important to know if there’s coloration in the tiny channels between the fibres, initially narrow air-filled cavities, as my flour-imprinting, thermal-cocktail-exuding Model 10 would predict. Any time you feel like doing a guest posting, Matt, you have only to say, given we’re both on the same wavelength. It would give me a few more days in which to continue sketching out my next posting where I finally sit in judgement on the whole of STURP and subsequent sindonology (a thankless unedifying task, believe me, given the almost totally non-joined up thinking). One or maybe two thousand words, more or less if you prefer, to sciencebod01@aol.com? I’d love to, but my time is limited, I’m a busy guy. Not only that I’m still learning the science (or lack thereof) behind the Shroud. Needless to say you are definitely more equipped to post about the subject. 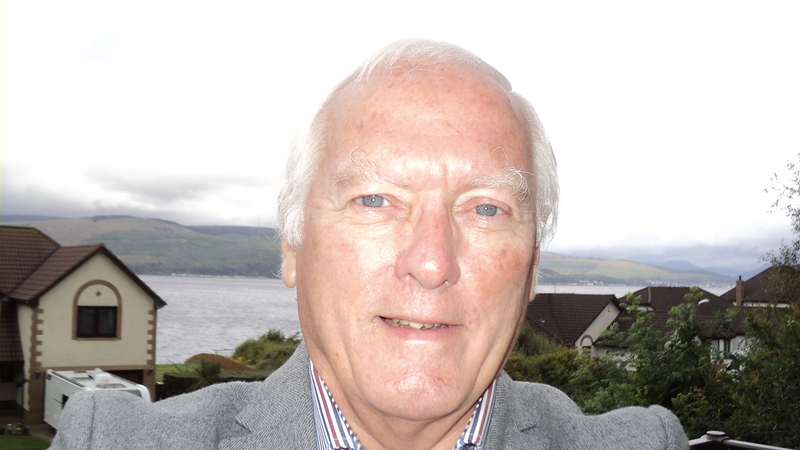 I do write on my spare time about a load of topics, mainly refuting young-earth creationism and miracle claims from the Catholic Church. I haven’t posted any of it on any forum since my writings are just for me to organize my thoughts. There’s a lot of b.s out there for sure and many instances of these religious zealots lying through their teeth to stir the fears and the “feelies” of the faithful. However, I will keep your offer in mind if I write anything that would possibly be of value for this blog. But I’m not kidding, would the people who own the Shroud allow you to take samples if you asked? Thanks for the feedback, and I will keep your offer in mind. They’re all pseudoscientists, in every sense of the word. And they want to keep it a mystery and exaggerate their claims and pretend the radiocarbon date was wrong and pretend there’s blood on it, and pretend it’s a photographic negative, and pretend some more.. It seems they want to keep it a mystery and get the feelies and keep the circus going. Btw, you’re a scientist, have you ever thought about getting your hands on the Shroud of Turin and do your own examinations? Or do they only allow believers. That posting is in preparation as we speak. It’s taking longer than expected. Why? Well, it means having to re-examine some of the claims of folk who have passed on and thus no longer around to defend themselves. That either strains my highly undeveloped diplomatic skills to breaking point, and/or risks blunting the intended message. One shall endeavour to err on the side of hitting where it hurts (the living) or no longer hurts (the dead)! There’s been too much kid glove treatment if you ask me, an essential component of keeping negative comment in the family and/or sanctifying dear departed relatives, and thus keeping the authenticity-promoting, playing-to-the-gallery show/circus on the road to continue its journey unhindered by the likes of we callow sceptics. (One has only to look at the provisional self-serving programme for July’s grandly titled “International Conference” in Pasco, Washington State to see what I mean. How do you like your image-forming and/or radiocarbon date-skewing body-emitting neutrons served up – by nuclear engineer Bob Rucker or lawyer-turned-celebrity-author Mark Antonacci, neither of whom responds to my emails) . Provisional plan is to post a skeleton version, hopefully by the end of the week, and then flesh it out in additional bite-size instalments – in other words to become by degrees a gradual living, breathing thing – one that makes best use of the informal open-to-all, feel-free-to-criticize blogging format chosen to report this still-ongoing raspberry-blowing project in real time. Hey, thanks for dedicating a post to my comment. I didn’t know it was worth that much. Looking forward to reading,“Turin Shroud: so how come STURP managed to get it so COMPLETELY wrong?”.